Arctic sea ice extent averaged for September 2012 was the lowest in the satellite record, according to the monthly summary from the National Snow and Ice Data Center; the long-term trend in the September (summer) minimum ice extent is now -13% per decade. All six of the smallest September average ice extents in the satellite record have occurred in the last six years, part of the evidence of the decades-long trend in Arctic warming. But surface area isn’t the only quality of the ice that is changing. Wind and ocean circulation patterns are conspiring with a warmer climate to reduce the amount of year-round (multi-year) ice, transforming the remaining ice into a younger, thinner version of its old self. The Arctic Ocean is largely surrounded by land, which limits the ability of sea ice to drift southward into warmer waters. Some ice continually flows out of the Arctic through the Fram Strait east of Greenland, but this ice loss has historically been offset by ice growth in the Beaufort Gyre, where ice can last for years. But the Beaufort Gyre has been a less effective nursery for thickening ice in recent years; young ice is less likely to survive its trip through the warm, southern part of the gyre. The Polar Science Center at the University of Washington uses a model to calculate sea ice volume. Patterns and trends in ice volume are similar to patterns and trends in ice extent in some ways, but different in others (and not just because the two groups use a different baseline for their long-term average). They are similar in that both sea ice extent and sea ice volume in 2012 were far below their long-term means. One difference between the patterns of surface extent and volume, however, is that measurements of sea ice extent show that, until 2012, no minimum extents matched the record low from the summer of 2007. But the Polar Science Center’s calculations of volume show that the summer of 2012 was not the only summer when volume fell below the 2007 value: sea ice volumes in the summers of 2010 and 2011 were also lower than 2007. This difference is consistent with the loss of old, thick ice. While the presence of first or second year ice will boost ice extent (or area) in some years, it will add little to the volume because it is so young and thin. The latest volume figures currently available are from August 2012, and they show a new record low for that month. *To smooth out daily bumps in the data, NSIDC uses a five-day running average, and calculations of sea ice extent have been refined over the past several years. National Snow and Ice Data Center. (2012, October 2). Poles apart: A record-breaking summer and winter. NASA Earth Observatory. (2009, April 20) Sea ice. Accessed September 19, 2012. Kennedy, C. (2012, July 10). State of the Climate in 2011: Arctic Sea Ice Minimum Extent. ClimateWatch Magazine. National Snow and Ice Data Center. 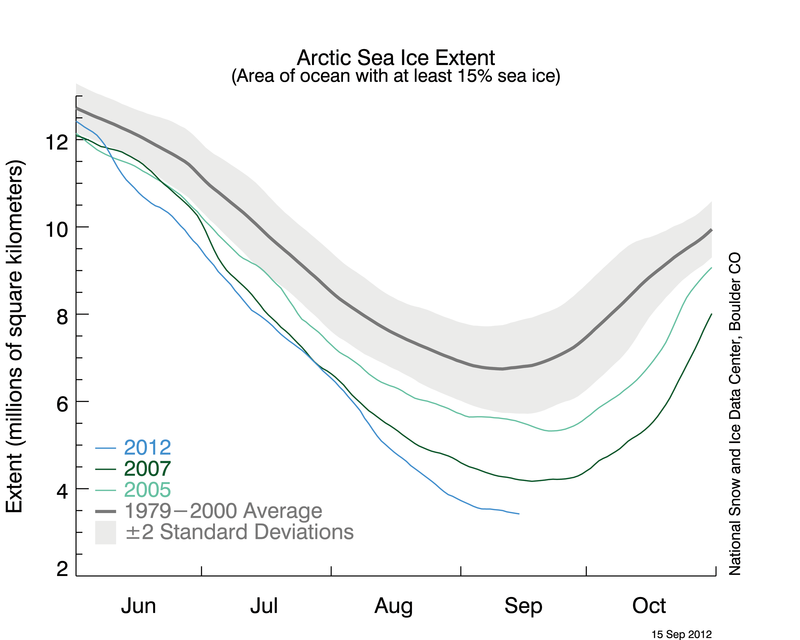 (2012, September 19) Arctic sea ice extent settles at record seasonal minimum. Accessed September 19, 2012. Polar Science Center, University of Washington. Arctic Sea Ice Volume Anomaly, version 2. Accessed September 19, 2012. Arctic sea ice extent set a new record low at the end of the summer melt season on September 16, 2012. At the same time, wind and ocean circulation patterns are conspiring with a warmer climate to reduce the amount of year-round (multi-year) ice, transforming the remaining ice into a younger, thinner version of its old self.